So, the next day after my energy healing session with the herd, reconnecting to an aspect of my Higher Self, there was an energetic shift, an opening for change! Yea! So I brought my resistance to change back to the herd for part two of our energy healing session. This time Seren helps me dissolve my resistance to change...throughout our session, you can see how she helps me move energy that is stuck in my throat chakra, where it gets lodged and causes me to gag, to the place where I can move it through fully with a big hearty yawn! Healing is like an onion- you peel back one layer at a time, dissolving the darkness, until you reach your brilliant core. And all along the way, if we are paying attention, our bodies will show us when it's time to dissolve the next layer of darkness. Sometimes the layers don't go willingly and it takes a few days to work them through!!! No worries, though. If you stay curious and willing, and keep turning toward the yuck, rather than away, the herd will shepard you through your healing stages, one day, one layer at a time! Or read about another energy healing the herd offered me- this time by refusing to work! Here: When Your Horse Refusing to Work is a Good Thing. Schedule some Healing with the Herd time for yourself! Sessions from one hour to 5 days are available, just email me to see how the Herd can help fast-forward your healing journey! Get Started with the Pledge! Want More Empowering Moments with Horse? Take an Epic Ride with Horse! As a psycholoigst and equine-inspired coach, my passion is giving you the tools to heal with the heart of horse! On our ranch, the Happily Ever After Holistic Healing Horse Ranch, outside of Denver, CO, I join with my Healing Herd to offer powerful programs to heal and reclaim your magnificence so you can live your heart's desires. 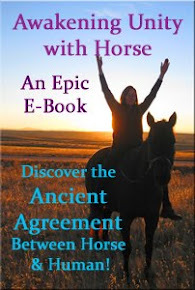 I'm the author of Awakening Unity with Horse and the editor of Spiritual Adventures with Horse. Day 28 Equine Insight into the Law of Attraction! Day 27 Creating Partnership Toward Your Goals! Author Interview 2! Who are YOU with Horses? 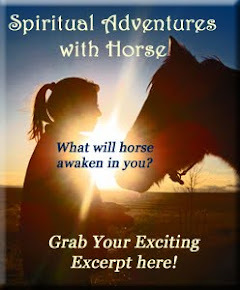 Day 23: Grounding Your Visions with Horse! Day 21: Are You Afraid of Getting Dirty? Day 18: Why You Feel So Great on Top of a Horse!